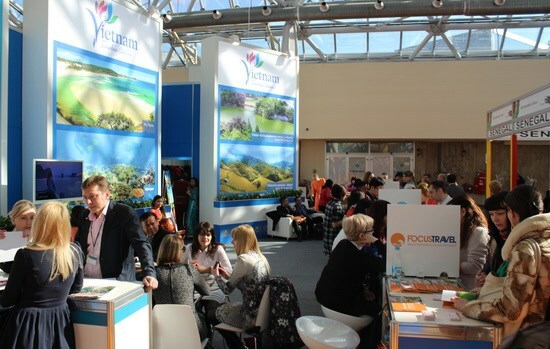 Moscow (VNA) – Vietnam is taking part in the 23rd Moscow International Travel and Tourism (MITT) Exhibition which opened in Russia on March 23. The Vietnamese pavilion run by the Vietnam National Administration of Tourism (VNAT), the national flag carrier Vietnam Airlines and eight travel companies covers an area of 72 square metres. A traditional art performance staged at the booth has drawn scores of foreign visitors to explore tourism in Vietnam. A video featuring beautiful landscapes in Vietnam was screened at a press conference held on the first day of the MIT to promote local tourism among international friends. Representatives from VNAT plan to meet with partners from other countries’ tourism management agencies, Russian tourism associations and international businesses. Deputy Director of the VNAT Nguyen Quoc Hung said Vietnamese businesses are launching a number of promotion packages to lure more Russian tourists to Vietnam this year in the context of diminishing number of Russians travelling abroad. He added that the VNAT along with the Vietnam Tourism Association and businesses have held some promotion programmes in Moscow, St. Petersburg and other Russian cities. Vietnam aims to welcome 400,000 Russian tourist in 2016 and 1 million in 2020. The annual MITT Exhibition is the biggest of its kind in Russia and fifth largest tourism event in the world./.